It’s better than sculpted SA IMO. Yeah it’s like a tall DSA. I like it but it’s not for everyone. Personally I don’t really like the colour way due to the gradient. If I could get solid colours I’d be more interested! kits are well thought out and pricing is also great, the non-standard kit has a good selection of keys that support 40% staggered but the drop is missing a split spacebars kit. This is very interesting! I think I personally like sculpted SA better but I have a wooden case that I haven’t been able to find a good keyset for, and this might be just the ticket. Is this the first time SP has rereleased an existing set in this manner? Also does anyone know if the blank teal keys in the Ergodox set are 2u in size? 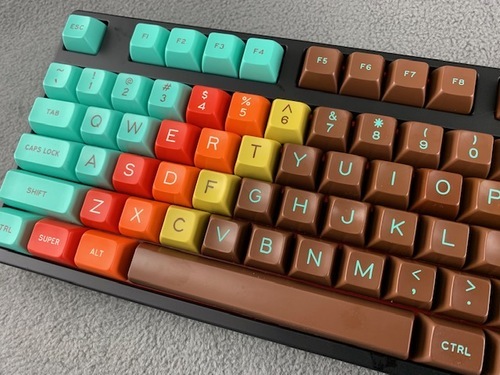 I would need a 2u shift for my DZ60, but wouldn’t mind using a blank if it fit the gradient. Picked up the non-standard and arrow kits. I’ve been needing them for a year now. Glad they re-ran the set.